This is the third Klenau disc from Dacapo. He was born in Copenhagen yet spent most of his life in Germany and Austria. In Copenhagen he was a pupil of Otto Malling but in 1902 was studying composition with Bruch in Berlin. Later studies were conducted with Thuille in Munich and Max von Schillings in Stuttgart. In 1913 he was appointed principal conductor at the opera house in Freiburg. He founded and conducted the Danish Philharmonic Society 1920-26, a period during which he promoted the music of Arnold Schoenberg. There was even a visit by the Master in 1923 for an all-Schoenberg concert. 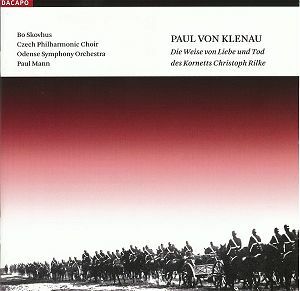 After this Klenau was a conductor in Vienna and Stuttgart. He returned to Copenhagen in 1940 and died there in 1946. His Third Symphony was premiered in Strassburg with Pfitzner conducting. The Klenau style moved from German romanticism (Strauss and Von Schillings) toward the lyrical bejewelled expressionism of Zemlinsky and Schreker and onwards into dodecaphonics and then back to toanlity. Opera certainly caught his attention and there are three twelve-tone operas: Michael Kohlhaas (1932-3), Rembrandt van Rijn (1934-5) and finally Elisabeth von England (1939); the latter variously re-titled in the political environment of the time. The wonder is that such a style was acceptable during the Nazi era although Klenau was a resourceful disputant and managed to present the style as fully consistent with National Socialist values and dogma. The notes point out that during his last five or six years he discarded dodecaphonics and concentrated on the writing of five symphonies (numbers 5 to 9) and another opera. Die Weise, to words by Rilke, is for baritone, mixed choir and orchestra and was completed in 1919. The style moves ecstatically between the early melodic Schoenberg of Gurrelieder and the Delius of Once I Dwelt in a Populous City. Klenau set the whole poetic sequence but divided it into three segments with 27 chapters, each of which is separately tracked here. Klenau conducted the premiere in 1924 at the Wiener Konzerthausgesellschaft. The work is sung in German with a fresh voiced Bo Skovhus who manages to catch and sustain the noble innocence of the man whose story he recounts. This is related in the third person observing the exploits and fate of Christoph Rilke von Langenau. The music parallels the interwoven themes of the life of a noble hussar, the confidences he shares with his companions, his pride in battle, his love for his mother, his awakening to manhood, his vulnerability, his experiences of battle and his death. Orchestral effects are delicately and finely judged. A defiant sprightly military piping can be heard in tr. 8 with choir and soloist lending a weighty threat to the proceedings. Listen to the piano and avian woodwind underpinning in tr. 3. Things become more barbaric and bloodier yet. In this the choral music reminded me, in its wild massed clamour, of Havergal Brian's Siegeslied (Symphony No. 4) (tr. 8) and The City Arming movement in Bliss's Morning Heroes. In tr. 6 there is a rapturously dreamy colloquy between the sighing Delian choir and Skovhus - just glorious. The Delian references are not over for the woodwind curlicues at the end of tr. 6 recall the music of the fountain in Delius's music for Hassan. Just occasionally as in trs. 4 and 7 you catch echoes of Mahler but these are not numerous. There is a strange episode during which the Cornet (cavalry standard bearer), on a moonlit ride, finds and liberates a bloodstained woman tied to a tree. The woman is represented by the strange cries of a soprano from the choir, Hana Skaroba. The pulse of cavalry hooves can be heard in the underpinning ostinato in tr. 13 as the troops draw near an isolated castle where they relax and enjoy the gentle company of women again. The Cornet is gently seduced by the Countess but not before some astonishingly beautiful dreamlike music rising almost imperceptibly to passion in tr. 17. I mentioned Schoenberg earlier on but in this we are talking very early Schoenberg. The music is lushly romantic in the manner of Zemlinsky and Schulhoff as represented by Randi Stene on that recent Simax disc. A winding and quietly lapping woodwind figure weaves in and out of the second half of this work. Indeed it ushers the work to its tranced close as, after the death of the Cornet in battle, his elderly mother is told of his death. I heard this hybrid SACD in standard CD mode. If you like the lapidary romanticism of Korngold, Schreker, Zemlinsky and Schulhoff with a dash of early Schoenberg and Delius then this is most certainly for you. Quite a discovery to set beside the less voluptuous setting by Frank Martin.